Check out the most thrilling sights forgotten by humanity. This abandoned chamber is located basically in the middle of nowhere, about 8 km from the closest inhabited village called Chukhloma. Formerly a charming mansion, brimming with life, it was built in a big village called Ostashevo, which died out in the 20th century due to the rapid urbanization process the Soviet Union faced. The landlord of the mansion was a rich businessman from St. Petersburg who constructed it as a present for his second wife, who was an Ostashevo local. The chamber was built in pseudo-Russian style, an unusual mix of Slavic and Bysanthine architecture. Nowadays the mansion looks more like a horror house from Russian-style thrillers and is almost completely forgotten except for the group of enthusiastic bloggers gathering money to revive it. 550 km to the Northeast from Moscow, in the Kostroma region, you need to catch a train to Galich. From the local bus station take a bus going to Chukhloma. The mansion is within walking distance from the village, but it would be wise to ask a local to give you directions. At the beginning of the 20th century, this grain elevator was constructed on the outskirts of the Ural city of Chelyabinsk. With the construction of the Trans Siberian railway, Chelyabinsk became an important trade station connecting Eastern and Western parts of the country. In several years the city grew so big that the elevator was no longer located on the outskirts but on the central square of the city. Soon after the end of construction, this huge 8-story building became the symbol of the town, resembling a skyscraper in the middle of 1-2 story residential houses. Now the building is completely abandoned, only the central (and also the highest) part of it is left. The elevator is closed for visitors, and a new guarded car park has joined it, which makes it difficult to get inside. The elevator is located in the central trade square of Chelyabinsk (1770 to the East from Moscow), where you can reach by plane or by Trans Siberian. The building was constructed at the end of the 18th century on the territory of the hospital for participants in the Patriotic war of 1812 against the French army of Napoleon and initially was a general district hospital. It became a maternity hospital in the second half of the 20th century, and was closed for reconstruction in 2009. The plan of this two-story building resembles the Russian letter “Ð”, with a basement and attic. The ceilings are more than 5 meters high, in spite of the fact that the building is totally abandoned, it still has central heating and is rather clean. Bloggers and people passionate about abandoned sites visit it on a fairly regular basis. The hospital is situated in the region of Vladimir, 186 km to the East from Moscow. This moody building of the Northern Crown hotel in St. Petersburg is surrounded by the spirit of nostalgia like the huge hotel Gran Budapest in the recent Anderson film – the only difference is that it never experienced times of glory when all the rooms were occupied. The construction began in 1988 and was led by a Yugoslavian company called Monteksgroexport. It was supposed to become a huge 5-star hotel with 247 rooms and 50.000 square meters of luxury cafes, receptions, corridors and terraces. Its construction came to a sudden halt in 1995 when 90% of the building was ready - since than it has remained abandoned. Mystic fans believe that the bad luck of the Northern Crown is somehow related to the death of St. Pete’s metropolitan Ioann, who died in the hotel in 1995 during the reception in honor of bank “St. Petersburg” 5-year anniversary. The hotel is located in St. Petersburg, Karpovka river embankment, 37. Unnoticeable from the street, this charming abandoned mansion is located in the industrial district of Vasilievsky island in St. Petersburg. It was built by Petersburger Nikolai Brusnitsyn, the rich owner of the local tannery. The mysterious story of the building claims that here the famous Dracula mirror is being kept in a secret hiding-place between the walls. According to local legend, the mirror was brought here in the 20th century from the Venetian Palazzo, where the dust of Dracula was kept. Soon after the mirror appeared in the mansion, the granddaughter of the landlord suddenly died. After the revolution the mirror was taken to the local Kirov Palace of Culture, and then returned to the mansion. After two more deaths of residents of the mansion, the decision was made to hide the mirror in a secret place inside the building, and until now nobody has found it. The mansion is located in St. Petersburg, Kozhevennaya line, 27. Russian lumberman Vladimir Khrapovitsky was fond of Gothic architecture after travelling to France in 1880. 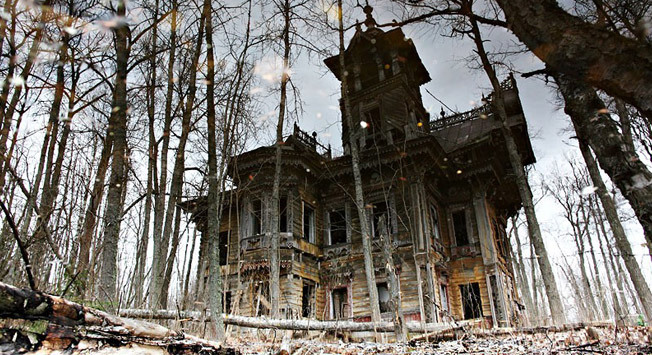 During the trip he made a bet that he would construct a Gothic mansion in the region of Vladimir. In several years he managed to build a huge castle in the French Gothic style with a park with ponds, cascades and gardens. After Khrapovitsy’s death, the castle was abandoned. Before WWII it was occupied by a technical machine school. In the middle of the 20th century it was converted into holiday centre. After a conflagration in the kitchen, the roof of the castle was completely destroyed, as well as some of the walls. Nowadays the building is completely abandoned. The mansion is located 200 km from Moscow, near the small town of Sudogda (3km). It is not a truly abandoned place. This creepy sight was built near St. Petersburg for the film “Stalingrad”, directed by Fedor Bondarchuk. The entire town was constructed on the territory of the abandoned military base in the village of Saperny and is considered to be the largest decoration for a military film. 400 builders took part in the construction of this scene, which took them 6 months and $ 5.000.000 to complete. The decoration is full of peculiar details (for example the fence of the German cemetery made of bed backs), and attracts a lot of photographers.